So you want to create your own tabs, eh? Recently a group member asked about creating their own tabbed content using images as the tabs. I posted the generic code needed to achieve the effect but decided it would make a neat little tip to put on the site as well. Tabbed content is great for formatting groups of text into one neat, easy to read area. And although there is speculation that Google will discount hidden text in its rankings, the majority of uses for tabs shouldn’t be in SEO critical pages anyways. To start, I created two sections. In the first section I gave an ID of tabsection and created one row with four columns. I each column I placed the image I wanted to use. The row has column container disabled, and marginless columns enabled. For the second section I gave an ID of textsection and created 4 rows to correspond with the 4 tab images. The content of these rows could be anything, but I stuck with a headline and text for simplicity. And the last 3 rows I gave the custom class hidden to hide them by default. I also disabled column container in order to maintain their horizontal position during the fade effect. Instead of setting up a listener on each tab, we’re able to listen to the parent row and count which tab was clicked on, and apply the class to the corresponding row in order thanks to them. Of course, there are dozens of way you can achieve custom tabs, this is just one way that I thought was easy to set up in X Theme. Hopefully, you find it useful! Trying to accomplish this, but I believe I’m missing something…I’ve noticed in my tabbed content, I didn’t have hover links, whereas in the demo, you do…Also, how are you calling the specific text content? Are you doing this by giving making the images links, then giving them #ID’s that correspond with the ID of the text content? Nope, no links needed, just the instructions above and the JS and CSS. The order of the columns in the first section will correspond to the order fo the rows in the second thanks to the JS. Just give the sections the appropriate IDs and you’re good to go. This was awesome. Really appreciated your help and it’s made my site look great. Thanks! Hi there, I’m trying to achieve this style (no bacon just text boxes) on the left. Is it possible to get the code to do that? Hey thanks for this! I was able to accomplish this pretty easily and it looks/functions great. Quick question though, is there anyway to link to having a specific tab open? 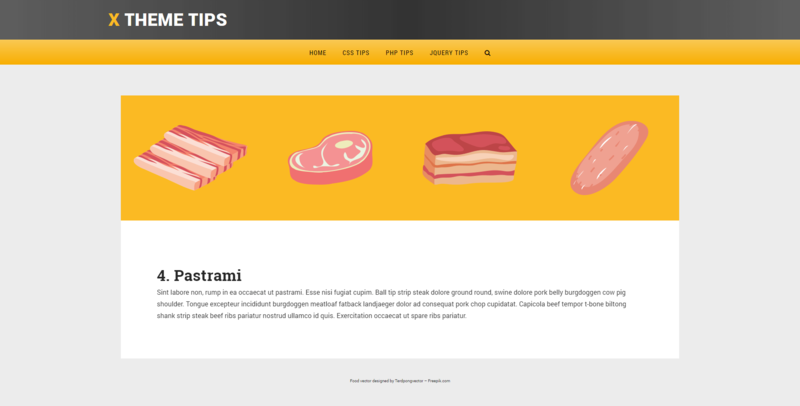 For example, if someone clicks on url(.co)/#pastrami , it will open up on pastrami instead of the default bacon. Also, is there a way for when someone clicks on an image, the page scrolls down to the content? Thank you very much for sharing! I’m wondering how could I set up the content to close upon click on the same tab. Hi Jaime, that would take some customization of the main js function. You could add a class to the tab on click, then check for that class in the main function. Or check the textsection row and if it’s currently open, add the class hidden. Although I may opt to slide toggle them instead of hiding them at that point. Excellent share thanks! – The only issue I have with it though is that it’s totally broken for mobile. The tabs don’t respond at all. Any fix? Do you have a link? We’ve used it on mobile without issue, so we would need to figure out what’s happening. This is really very cool and thanks for sharing this. It was very easy to recreate this on my site but I’m having one issue – in that when the page first loads all the content in the textsection appears until the user clicks one of the images in the tabsection. I added the ID’s at the section level for both text and tab and from row 2 – 4 added the id hidden but must have missed something. Any ideas? Worked like a champ and completely read class and dropped it into ID. One question for you if I want to reference these sections then would I just use the ID fields for each row them to make them directly accessible say via menu link say like http://www.website.com/#hotdog? Cool! Thanks I’ll attempt this. Really appreciate the support Michael. I have implemented the custom image tab on the following two pages. But what I am running into is that each tab has a video yet they all want to play the far video on the right hand side (tab 4) verse the tab that is exposed. Any Ideas on how to fix this? Hi Michael, some great stuff! I am having one issue. The content for the first corresponding icon shows as expected but if I click on the first icon it shows the second row of content and each following icons loads one off; click on icon 1 and it shows content 2, click on icon 2 and it shows content 3…. It looks like I might have put the wrong code into my gist. Do my a favour, change the eq(textshow) to eq(textshow - 1) and let me know if that works for you.